You are being served a version of this page without styles because your browser is an older version. Everything is still available and functional, but the presentation is plainer than intended. BAOC has several folks who can help you prepare for your event and make sure it runs smoothly. Some, like the Insurance Director, you should contact as early as possible to ensure your event will take place as scheduled. Others, such as the Equipment and Mapping directors, will supply vital supplies for your event. Please see our contact page to contact these valuable volunteers. Events coordinator - Manages the overall BAOC events schedule. Keep in touch with this person as you plan and organize your meet; they need to know immediately about any schedule changes or problems. Insurance coordinator - Takes care of the insurance for your event. Contact this person several months before the meet, as soon as you make initial contact with the park rangers. Equipment manager - Provides the physical equipment you need: signs, controls, clocks, clipboards, map boards, start/finish banners, etc. There are three; contact the the one for the region where your event will be held: North Bay, East Bay, or South Bay/Peninsula. Mapping director - Provides the maps for your event. Be sure to get maps for planning the courses as well as for the event itself. If the map is in OCAD, he can print maps premarked with the courses and any course corrections you provide. E-punch coordinator - Supplies all the e-punch equipment, and can provide or train e-punch staff (including you!) for the event. Registration manager - Handles all registration responsibilities before and during the event. There are three; contact the the one for the region where your event will be held: North Bay, East Bay, or South Bay/Peninsula. 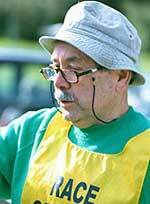 Start-O coordinator - Arranges for a Start-O course (for very young children) and provides the maps and equipment needed. Bulletin editor - Publishes announcements and results for your meet. You should publicize your event in the Bulletin for 2 issues. Send the editor your preliminary announcement 2 issues before the event (3-4 months ahead), and provide updated info (including course stats, if available) in the issue concurrent with your meet. Be sure to send the editor everything you need printed BEFORE the publication deadline. Webmaster - Publishes announcements, directions, course stats, event details, coursesetter notes, photographs, maps, results, and whatever else you want to tell web visitors before and after your event. Unlike the Bulletin, you can update your web announcement up to the day before the event; both BAOC members and newcomers visit the website for the latest event info, so be sure to take advantage of it! Publicity manager - Can publicize your event via flyers, advertisements, etc., to various media, including newspapers, newsletters, TV and radio stations, websites, etc. They also may arrange newspaper or TV interviews before, during, or after the event. There are three; contact the the one for the region where your event will be held: North Bay, East Bay, or South Bay/Peninsula. Event quality director - Advises with you about coursesetting and can provide vetters to prerun and critique the courses. Technical director - Can supply official O' details such as orienteering rules and practices. Membership director - Can supply a BAOC roster that contains contact info for all members, so you can contact them for volunteer help. Social director - Can arrange a potluck or other social event for your meet. Treasurer - Reimburses your expenses for an event.